We found a pigeon Sunday November 8, that had been stuck by a car on the right wing and face. We rushed him to the SPCA, where they informed us that they'd euthanize him because of the injuries. We requested a few moments to say our good-byes and decided to clean his face using a little water. To everyone's surprise he tried to drink and after we picked up a dropper he actually drank some water. The girl at the SPCA told use that if we left him there he'd have no choice but if we took him home and hand-fed him, he might have a chance. Since then we have used a syringe to feed (Tropicana power) and water to him. Yesterday our landlord found out we had a pigeon in the apartment, and pointed out the restrictions on our lease, giving us till this week-end to remove the him. We need to find a loving home for him, because everyone deserves a second chance. 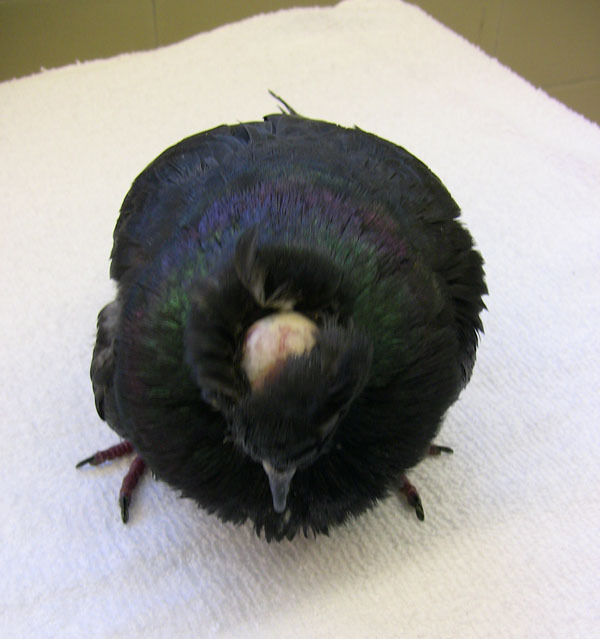 He as a bruised right wing and the a part of his scalp as been removed, making it difficult to open his eyes. He needs to be hand-fed and has a healthy appetite with regular bowel movements. When in sunlight he grooms himself and stands tall. His location is Montreal, Quebec, Canada. I have an idea and I'm going to send you a private message on this site. Many thanks for taking this poor baby under your wing, bless his heart. A true pigeon angel you are. If you explained to your landlord that you are desperately looking for a home for this little one and someone is working with you to do so, it might buy some time. We will be thinking positive thoughts that all works out. I am sure you will find someone to take him in and provide a loving home. Till then as Cindy suggested, you could try talking to your landlord and tell him that you are looking out for a home as soon as possible and he could give you some more days. Praying that the baby gets a good home soon and for its recovery. Anything new about this poor pij? Does any one have connections in Montreal that may be a cotact for Manuel? I will take him! I already emailed the rescuer but have had no reply yet. 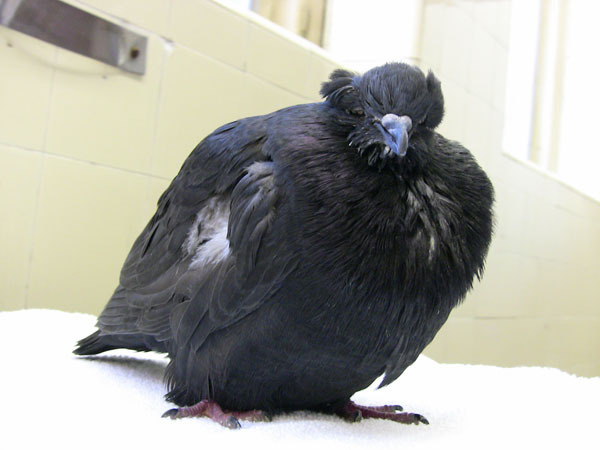 We found a hospital in Ottawa that will take the pigeons and take care of them and then release them together in the spring (a flock of about 20) We will be taking my Lucky there soon and we can take him too. I know he should be released close to where he was found but this is his only chance to get medical care. Have I ever told you that I love you?! Well...I do. Thank you so much. I have been calling around this morning and getting very frustrated. You have made my day. 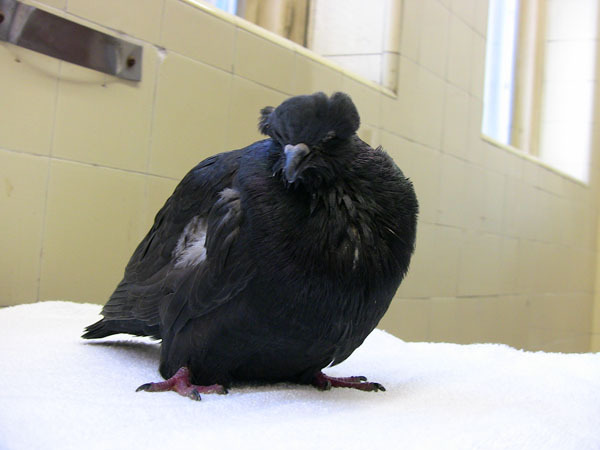 Will you post the pospital that takes feral Pigeons please, so we can have them as a resource? Well let's just hope he is still with us. - No need to call before, just show up. It is a little tricky to get there and Google maps gives the wrong directions so they suggest calling them when you are near. When the bird comes it they give it a full assessment. If the bird needs special care (injured for example) it is kept separate from the other birds until it is on its feet. If the bird is healthy or once back on its feet it is put together with other birds (generally there are about 20) in a big place with windows where they can socialize and wild up in case they are human imprinted. Then they are released when the time is right. Right now it is too late so they will keep them over the winter and release them next spring. I just hope the poor pigeon is still hanging on. If anyone hears please post the outcome. Thank you LovelyFlight for letting us know. I'm just so pleased that everything is working out and the poor bird now has a place to go. THANK YOU Manuel for rescuing and saving his life. You have done a great deed. Another big thank you to LovelyFlight for finding him a home. The little guy is in bad shape. I have Manuel's phone number and I will email it to you, Lovelyflight. I just spoke with Manuel. He found a temp home for the pigeon until Wednesday. He now has the URL to the Ottawa rehab centre and will let me know if he decides to send him there with Lucky and Pepere. The pigeon is doing well; he is improving. I told him I was willing to take him. From the bottom of our heart we would like to thank Matilda, LovelyFlight and all the other wonderful, marvelous, beautiful people at Pij'n'Angels (And PT, where this all began) for their support and help in finding a home for this handful of feathers who unwillingly came into our lives and quickly won our hearts. From him and the both of us to all of you a great Big Hug! I'll call LovelyFlight tomorrow to arrange a delivery time. PS. We would be honored if the members of this forum would help pick a name for him. Once again teamwork at it's finest. Manuel, Charis and LovelyFlight, lots. If at all possible please do keep us posted on how things go. Manuel...I'll be thinking about names. What street did you find him on? When you Angels get together there is no stopping you. This is an incredible story of teamwork, with yet again another happy ending. He was found on Pine Avenue. ...Pine would be a rather odd name for a little Pigeon. How about we name him after you? I'm so glad to hear the good news regarding this pigeon! It has made my day! I think that's a great idea, Charis. Funny but true: Almost all of my parents' pigeons are called 'Manny', which is my mom's general name for pigeons. And I've gotten into the habit as well! If I can't think of a name, the pigeon will be called Manny until a better name pops into my head. So why did this originally happen? Wellllll.... they got their first homing pigeons years ago from a family friend named Manuel (aka: Manny!) And the rest is history!